If you are an active Facebook user, then you would know about Facebook groups and how convenient it can be to connect with many people at one time. It is an excellent medium to share ideas, plans and discuss with others. Groups allow its members to come closer and not only share their opinions on various subjects but also share their photos and videos. Many Facebook users have created groups which include members from all around the globe. If you too are the administrator of such a group, then you would be aware of the management it takes to maintain the group. Many a times it may happen that members of group post irrelevant or inappropriate content which can also hurt the sentiments of other members of the group. Though, as an admin you always have an option to delete those posts, however wouldn’t it be better if you can review the posts before being posted. So, folks here is a simple guide to help you set an approval request before a post goes up in a group. Note: You need to be a group administrator to perform these steps. Login to your Facebook account and click on Groups icon in the left pane. Open the group for which you have to set an approval before posting and click on 3 dots next to Share. From the drop-down list of various options click on Edit group settings. Now scroll the page till end. Here you will find an option Post Approval. Check mark the box next to “All group posts must be approved by an admin or a moderator” and click on Save button. 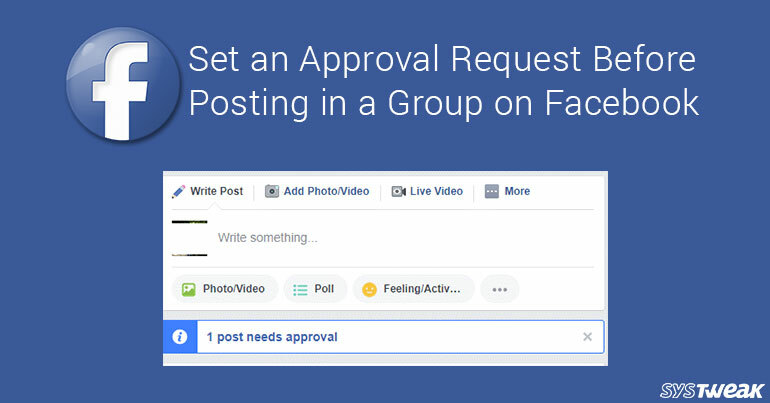 Now, when any of the group member would try to post in the group you will receive a notification for approval. When you open that group, you will find a notification like, “1 post needs approval”. Now when you click on Pending Posts you will see the post which needs an approval. To approve the post, click on checkmark. If you do not find the post appropriate, then click on cross to delete it. However, in case you are terribly annoyed by the post and want to block the poster along with removing the post then click on black circle. If you approve the post it will be posted in the group and the poster will also receive a notification that his post is approved. It is a quite simple process which once implemented will free you from the worries regarding any explicit post a group member can share. Now a post can only go live once you find it appropriate.